I am married and live in London. I lost my hearing quite suddenly through an auto-immune disorder in 2010. I now mentor other cochlear implant candidates as I enjoy helping other people living with hearing loss. 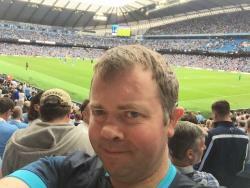 I am a keen Man City fan. I can hear conversations again which I wasn't able to do before. Also, I now enjoy listening to music again and can speak to my family on the phone again, which I couldn't do before. I feel much better connected to my wife and family. listen to my favourite Oasis music again and hear the roar of the football crowd when my favourite team Man City scores a goal! listening to my dog Jake's claws as he runs across the laminate floor. it had the best technology and because of the T-mic which is brilliant for using on the phone. Also because of the connectivity as I can connect it to my Roger Pen and Compilot. The technology is brilliant. I have lived through acquired hearing loss and I know how challenging and isolating it is. I want to help others through my own experience of hearing loss. Also AB have helped me, so I want to give something back. Giving support and advice based on my own knowledge and personal experience of being a recent cochlear implant recipient.